I am legally blind in my right eye as of recently, due to an accident. Even though I am right handed in almost everything, my left hand is dominant in random activities (such as batting in baseball, receiving but not serving in tennis, and shooting/passing in hockey, etc.). Since I can't see out of my left eye, yet it feels more comfortable for my right arm to be the strength - bearing arm - I'm not sure which eye/arm should be my dominant in archery. I am sorry to hear about your misfortune but I am inspired by your resolve to overcome the obstacles. First I want to say that there are no rules about which eye or hand to shoot with. There are many excellent archers who are highly successful cross-dominant shooters. Your predicament is different from being cross dominant but there is good news. 1. There are no rules about proper shooting form and technique – Only suggestions. 2. There are no rules about the way you set-up or modify your equipment to accommodate your physical requirements. If I were working with you we would explore many different equipment configurations that allow you to shoot with your dominant arm/hand while aiming with your left eye. 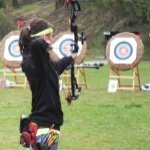 This first scenario would require you to move your nose to the opposite side of the bowstring and acquire a different anchor position that still allows you to come to full draw and achieve shoulder alignment so you can still hold with back your muscle. 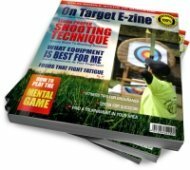 There are many other technical aspects to consider but this method does work and you can achieve a high level of success with your shooting skills. The alternative approach is to hunker down and teach your less dominant arm to learn fine motor skills and strengthen it so you can shoot left handed and be very effective. For younger people I have been able to re-train them in a relatively short time frame. For older athletes it takes much longer...mostly because they are more settled in their ways. My suggestion is to patiently explore the many options before you decide which direction you want to settle. If you would like to pursue assistance through long-distance coaching feel free to contact me.